Through three years in Mooseheart’s Naval Junior Reserve Officers’ Training Corps (NJROTC) program, Amanda Jones has proven to be a leader. While there was a certain feeling that Jones would become the Commanding Officer (C.O.) for her senior year, it was still a surprising moment when that elevation became reality at Friday’s Change of Command ceremony. “It was an overwhelming feeling of ‘this is it.’ Every year, going through the platoons, I was thinking ‘someday this is going to be me’ and then, it was me. I have a lot of responsibility now,” Jones said. The name of the incoming C.O. is always a well-kept secret, and Jones was unaware she would be receiving the honor until her name was called. She said NJROTC participation the last three years has been life-changing. NJROTC participation is mandatory for all Mooseheart High School students. “I never would have done half the things that I do today. I never would have participated in sports. It gave me a way to learn leadership. I love every aspect of it, especially drill and color guard. I go to as many of the parades and color guard ceremonies as I can,” Jones said. The change of command involves the outgoing C.O. handing the commander’s sabre to the incoming C.O., and this year senior Styles Redmond handed command to Jones. “It feels like just yesterday that I was an eighth-grader and all of this was beginning, and then it’s also like I just woke up and this is already all over and I’m giving the sword to Amanda to begin her journey as C.O.,” Redmond said. Despite the seeming breakneck speed with which the year progressed, Redmond said there were moments where he tried to remember the events as they took place. “Even during the Change of Command, I found myself standing there thinking ‘I should remember this moment so someday I can tell my kids what it was like to be C.O. of the NJROTC at Mooseheart,” Redmond said. While Redmond said he does not currently plan a military career, he said his experience in NJROTC has been very beneficial. 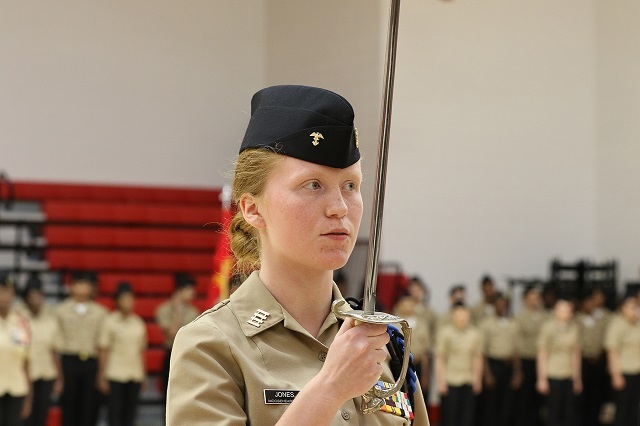 “I used to be more shy and NJROTC helped me step out of my comfort zone and ultimately, it helped me become the C.O. I will definitely miss this,” Redmond said. U.S. Navy Warrant Officer (Ret.) Rick Smith, Mooseheart’s NJROTC lead officer, said Redmond would be missed as C.O. Smith and U.S. Marine Gunnery Sgt. (Ret) Ruben Hinton administer Mooseheart’s NJROTC program. “Styles has been a leader since before he was in high school. I remember when I had him as the quarterback of our middle school football team. He’s always stepped forward band been a leader,” Smith said. At the same time, Smith said he looked forward to Jones’ upcoming year leading Mooseheart’s company. Jones has been a platoon leader since eighth grade, though Smith said students including Brittany Tovar were also well-qualified to be the C.O. “(Jones) is consistent and treats everybody fairly and I think people respect her for that,” Smith said.